Your Microchip Petporte smart flap® will only work if your cat has been fitted with a microchip or you have a collar key. At present, some older and non-standard microchips may not work with this cat flap. You can check to see if your cat’s embedded microchip will work by entering the microchip number in the box below and clicking the “check” button. You will find your cat’s microchip number on your microchip registration form from your vet. Please note that chips with 10 digits, lettered characters, and those starting with 977xxxxxxxxxxxx and 98514xxxxxxxxxx are not currently compatible with the cat flap. 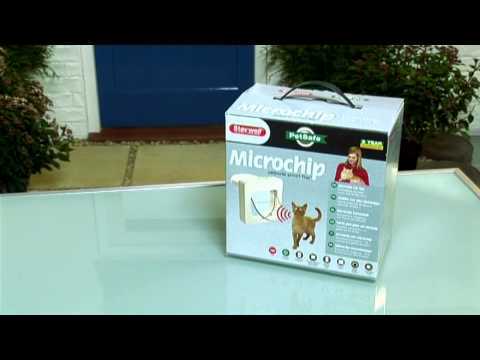 How do you set the timer on the Microchip Petporte smart flap®? To set the timer, you need to set the unlock time and the lock time at the time when you want the door to lock and unlock. For example, if you want the door to unlock at 7:00, program the unlock time when it’s 7:00. If you want the door to lock at 20:00, program the lock time at 20:00. Press the red and green button at the same time for 2 seconds. Both lights will flash and the door will beep. Select extended mode 7 by pressing the red button 7 times. The unit will beep each time you press the button. Wait until you hear the beep to press the button again each time. Press the red and green button at the same time. The green light will be on and the red one will be flashing. Press and release the green button. Press and release the red button. Now set the unit into night mode by pressing and releasing the red button. The red light will stay on. The unit will now lock and unlock at the set times of days. Note the following about the timer. The resolution of the timer is 10 minutes. The timer will not work in battery mode. The timer will only work when the door is plugged in. If you get a power cut, then you will need to reset the times again. How do I adjust the read range on the Microchip Petporte Smart Flap? Press and hold both buttons until the lights flash. The unit will emit a long beep. Press the red button 8 times. The unit will beep each time you press the button. Wait until you hear the beep to press the button again each time. Press both buttons together. The cat flap is now in test mode. The red light will flash when it detects a microchip, and the green light will flash when it recognises your cat's microchip. Remove the 4 screws on the front cover of the door, then remove the front cover. Have another person hold the cat outside under the scanner as if the cat is trying to get in. Find the black screw on the electronics board of the door. You may want to mark the position where the screw started. Adjust the black screw on the electronics board, turning it a millimeter at a time one way and then the other, until the green light flashes the most. You’ve successfully increased the range. You can bring your cat inside. To remove the cat flap from the test mode, unplug the door and remove the battery if being used. Press the red button for 1 second, then plug the power back into the cat flap. Stray cats are getting in even though my Petporte smart flap® is working. Unfortunately, there are some very clever cats that can get their claws under the door and pull the door towards them and then climb in under the door. Put a piece of cardboard over the see-through flap. Strays often won’t recognise this as a place to enter. Keep food or water away from the Petporte. Food especially will encourage strays to come to the flap. The Microchip Petporte smart flap will not scan my cat. Make sure your cat’s chip is compatible with the Petporte. Use chip checker tool. If your cat has a Bio Therm (temperature reading) chip, this is not compatible. These chips can sometimes stop working. Some examples of Bio Therm numbers include 985 140 000123456 and 985 141 000123456. Your cat’s chip may be faulty. Virbec chips had a faulty batch in February 2012 with the prefix 90008800 - 90008800259208. These might come up as compatible on the chip checker, but if it is from the faulty batch, it will not work with the Petporte. You will need to get a new microchip for your cat. The chip may have migrated to a different place in your cat’s body. It is normal for some microchips to move from the original position, between the cat’s shoulder blades, to another place inside your cat, possibly to the left or right side of your cat’s shoulders. This will not harm your cat. To tell if the chip has migrated, gently hold your cat near the door. Move different parts of your cat up to the door, starting near the your cat’s shoulders. If you have determined that the chip has moved, you have 2 options. Adjust the read range to the side where your cat’s microchip is. For example, if the chip has moved to your cat’s left side, set the microchip scanner to read your cat’s left side. If you have more than one cat, the above method will change the scanner side for all cats. For multi-cat homes, adjust the read range as follows. You will need someone to help you with this step. 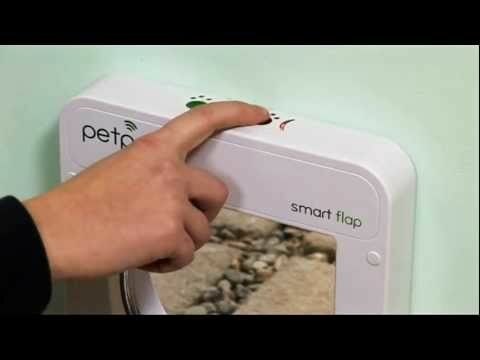 The Microchip Petporte smart flap® will not turn on. Is the scanner wire connected properly? Is the cable plugged inside the unit correctly? If you are using an extension lead, has the extension come loose at the connection? Press and hold the red button for 10-15 seconds. This will clear the circuit board. Plug the unit back in. Press and hold the green button for 30 seconds to restore the door to default settings. Put the battery back in. The door should now power on. The Microchip Petporte smart flap® will not work on battery. The door will only run on battery power if it is unplugged. The battery is meant to be a backup in case there is a power outage. Some functions will not work on battery-only mode, including night mode. In battery-only mode, the door goes to sleep to conserve battery life. It is not constantly scanning for your cat’s microchip, so your cat will need to tip the door to wake up the door and allow it to open. The green lock is not working for my Microchip Petporte Smart Flap. Remove the 4 cap covers and screws in each corner of the inside of your flap. Check the green lock. The green lock is in the bottom left corner. Make sure the lock is in place. Check the spring, a very fine piece of fuse wire. The spring is above 2 small teeth on the bottom of the green toggle. The spring is held into place by screw with a green washer on the right hand side of the main green lock. Make sure the spring is in place. Check the green toggle and ball joint. The green toggle is the beak-shaped green piece that moves to allow the cat to enter after being scanned. The ball joint comes out of the top of the green toggle. If the spring or lock is not out of place, follow these steps to reset the door.